NEW YORK (CNNMoney) -- After more than a year in the making, the Obama administration on Wednesday released its plan to overhaul the corporate tax code. The main proposal for reform would slash the corporate tax rate to 28% from 35% and pay for the reduction by eliminating "dozens" of business tax breaks. There are currently more than 130 on the books. The Obama administration's plan is in sync with Republicans in terms of wanting to lower the top rate. But Republicans want to lower the corporate rate even further to 25%. There are also many other differences between their plans, and with Congress stuck in election-year gridlock, the odds of passage of any corporate tax reform plan this year are long. Tax experts generally recommend that lawmakers lower the top rate to boost U.S. competitiveness. The United States has one of the highest nominal corporate tax rates in the world -- a factor that may reduce business investment. Today, however, thanks to the bevy of tax breaks available to them, most of the largest corporations end up with effective tax rates far below 35%. Indeed, in many cases, they may pay far less than 25%. The administration said a 28% U.S. corporate tax rate would be in line with the average rate among other advanced economies. U.S. companies' abroad: A key goal of the administration's plan is to discourage companies from moving their assets abroad and parking their profits there for years on end. To that end, the administration wants to impose a new minimum tax rate on the foreign profits of U.S. multinational companies, although it did not offer a target for what that rate should be. Currently, U.S. companies with foreign subsidiaries may reduce their federal tax bill in a variety of ways, including by deferring the federal tax they owe on their foreign-made profits until they bring that money back to U.S. shores. By contrast, the administration's proposal would require companies with foreign income in low-tax countries to pay the minimum U.S. tax rate on that income when it's earned. If the company pays income tax to the host country on those profits, it will get a foreign tax credit. For example, if the U.S. minimum tax rate is set at 20% and a company pays 8% to the host country, it will have to pay the 12% difference to Uncle Sam. It's not clear how profits that U.S. companies have kept abroad for years would be treated under the minimum-tax rule. Obama's plan would also remove the tax deduction for moving expenses that U.S. multinationals get when they move operations abroad. Conversely, U.S. multinationals that move operations back to the United States would get a 20% tax credit. Manufacturers: The plan would seek to ensure that the effective tax rate paid by manufacturers does not exceed 25%. Currently, the average tax rate for manufacturers is 26%, according to senior administration officials. A company's effective tax rate is generally the net amount it pays in federal taxes as a percentage of its income. The plan would reduce manufacturers' effective rate by reforming the deduction companies get for manufacturing goods in the United States. As the tax break is currently used, the term "manufacturing" may be interpreted very broadly to include things like the making of fast food hamburgers. The administration wants to increase the value of the deduction but focus it more narrowly on actual manufacturing. It would also reform and make permanent the research and experimentation credit, which has been on the books for years but is still considered "temporary." Likewise, it would make permanent and consolidate temporary tax incentives to invest in clean energy. Small businesses: The administration says it wants to reduce and simplify taxes for small businesses, which devote nearly 2 billion hours and spend up to $16 billion on tax compliance, according to the Treasury Department. Among other things, the president's plan would let small businesses permanently write off up to $1 million in investments. It would also allow small businesses to use a simpler form of accounting than so-called accrual accounting, which requires them to recognize future cash receipts and costs on their income taxes. Timing of reform: The last time the United States embarked on major tax reform was in 1986, when the economy, international trade and technologies were vastly different. "The current tax code was written for a different economy in a different era. 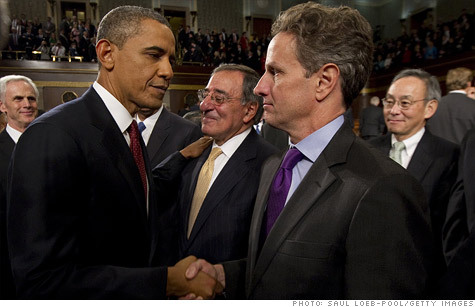 It needs to be reformed and modernized," Treasury Secretary Tim Geithner said on Wednesday. He noted that the administration's plan is intended "to begin a process of building a bipartisan consensus" for tax reform. To that end, he said, he will be meeting with the chief tax writers in the House and Senate next week. Indeed, given the lack of numbers and other specifics, the administration's proposals can only be a starting point for discussion. A top Republican lawmaker on tax issues, House Ways & Means Committee Chairman Dave Camp, welcomed the administration's proposal, especially its call for lowering tax rates and closing loopholes. But he also said that policy differences remain, notably how the Obama plan would treat multinationals and how it doesn't do much to address small businesses that file under the individual tax code.